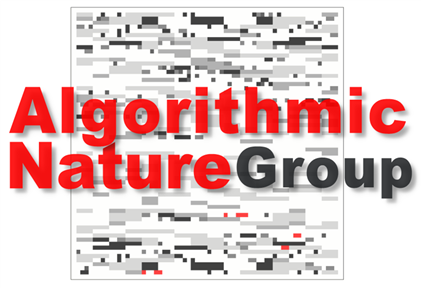 The Algorithmic Nature Group undertakes fundamental and applied research on topics at the intersection of several disciplines clustered around the concept of algorithmic information. It aims at connecting nature and computation through simulation and experimentation with digital systems and small computer programs. The group is affiliated to the Paris-based Laboratoire de Recherche Scientifique (LABORES) for the Natural and Digital Sciences and is supported by various organizations and individuals from several European universities who have decided to work together, disregarding frontiers, in order to tackle challenges in complexity science using cutting-edge mathematical theories and computational tools. The Algorithmic Nature Group is the responsible lab for two major projects: the Online Algorithmic Complexity Calculator (OACC) and the Human Randomness Generation Project, one of the pillars of the concept of Algorithmic Cognition (see Publications). The group has also devised the Block Decomposition Method based on algorithmic probability to reconstruct objects from the bottom-up to estimate upper bounds of Kolmogorov complexity and algorithmic randomness. More recently, we have proven that the world may be much more programmable than previously thought, and we showed that Turing universality is pervasive and ubiquitous among random abstract computer programs breaking some previously believed boundaries. Go here for more on publications or here for a list of research interests and other projects.